So the summary posts have been delayed by finishes!! Nine of them between the two days. Clearly the bell curve bunch. Saturday saw the winds fill back in for the back end of the fleet and the middle of the pack approached the island. First were Rainbow, during the day, and Fugu and Riff Rider, during the night. All the while the comfort clump is sneaking up. Thankfully, daylight greeted the first of the next six finishers roughly each an hour or two apart. Dark Horse lead the pack, with JouJou, Jacqueline, Dolfin, Iris, and finally Crazy Rhythm finishing off the day just before Tree Time. The next due in would be the following morning. Sleep for RC. Kyntanna followed a couple of hours by the Owl. All are well and in safe. We are now only awaiting our dear keeper of the east Morning Star. We expect him possibly tomorrow afternoon. Remnant rain of a tropical depression is moving through the area to day with light winds forecast offshore. They may slow Morning Star somewhat, but we look forward to his finish. Today saw the finishes of Passages and Nightmare, congrats to them! The rest of the fleet saw lighter more manageable conditions and sentiment traded back to how great the sailing is, except for the poor sods who have AP or electric issues. They kinda stayed at the “just get me to Hanalei” mindset. Folks in this category are Crinan II, who hand steers and stops to rest, Riff Rider is doing the same, and Fugu who, with full sun, did manage to get some power and some rest from hand steering to conserve amp hours. The latter two crossed paths with each other today. Crinan II will be the next to finish tonight. The comfort clump continued to enjoy great conditions and they are still seeing good wind. Dark Horse continued sprinting ahead and now has fewer miles to go than JouJou – quite a show. Morning Star has less than 550 miles to go and then this race will move into history. Winds are forecast to lighten up over the next few days, lets hope a lot of distance is traveled before then. I can’t tell you how wonderful it is out here today because that might jinx us. So I won’t mention the warm, steady trades blowing 15-20, the seas smoothing as the cross swell diminishes, the beginning of puffy tradewind clouds, the vast expanse of the sea all around with no hint of the distant civilization over the horizon, just the soft moan of the wind, the sound of breaking waves and of clear blue seas rushing past Dolfin”s hull. I can’t tell you any of this because then Mother Nature might take it away. But I can tell you is it’s pretty nice out here. At least one racer can attest to that rainbow so far. 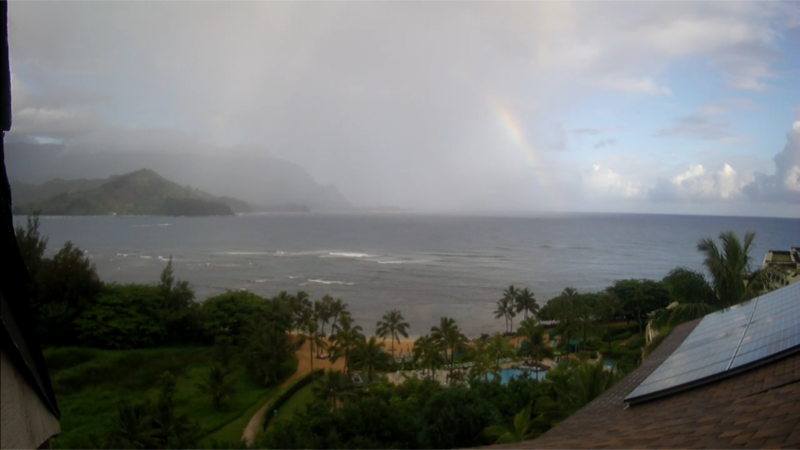 Double Espresso made it into Hanalei bay just about at sunrise, in time to see there really are rainbows. Passages and Nightmare are due in later this evening and tonight. Crinan II, despite reporting a series of issues and a lack of functioning AP, is still holding his own and will follow. Rainbow has been silently creeping up on others who are contending with some issue or another and is now on pace to be the fifth finisher. Riff Rider, Fugu, and JouJou (the others) have all reported power issues or AP issues and so are sailing much more conservatively. Taking the opportunity to gain some ground is Dark Horse, who may actually pass some of the former leaders. The comfort clump is still rocketing along, all be it with a little bit less wind, and a lot more sun, and eastern Morning Star is still keeping pace. He could get a boost in wind from the front of the tropical depression remnants. He should be far enough ahead as to not get stuck in the dead wind behind it. Looking forward to more arrivals and the official beginning of Tree Time – let the Mai Tais flow!! Congratulations to Philippe on Double Espresso – First to Finish on Elapsed Time at 8:38:11 PDT!!! Next expected is Passages, and then Nightmare, both sometime later this evening. Posted on July 5, 2018 July 5, 2018 Author pueoCategories Crazy Rhythm, Crinan II, Dark Horse, Dolfin, Double Espresso, Fugu, In Hanalei, Iris, Jacqueline, Joujou, Kynntana, Morning Star, Nightmare, Owl, Passages, Racer News, Rainbow, Riff Rider1 Comment on First Finisher!! Day 11 Summary – Remember that carnage? Well, there has been more carnage reported, but so far everyone is doing fine and hanging in there, from a lost solar panel to a ripped main sail on a boat that only has one sail, to AP issues, to various lines breaking free, the increased winds have dealt their blow (ha, pun) – the back half of the fleet has gotten the strongest, reporting sometimes 33 kts. The sentiment is starting to switch from let’s enjoy this great blue yonder to: yeah, I’m kinda over this and can’t wait to hit Hanalei. Well, for our fastest boat the wait is almost over as he is expected to arrive sometime Thursday morning. RC is gearing up to be ready to greet Double Espresso as he makes landfall. We’ve seen our clump stay dispersed somewhat today and Dark Horse, despite suffering some of the aforementioned carnage, has continued to surge and is almost overtaking JouJou. Riff Rider has hung back a little, likely due to AP issues, as well Fugu, suffering some charging issues, may rest. Until he jibed back, it almost looked as though he decided to go see the erupting volcano on the Big Island and give Kauai a miss. He’ll jibe back again. Dolfin, and his AIS alarm, have kept their distance from Jacqueline, and Crazy Rhythm has volunteered to keep Jacqueline company instead. Winds should lighten up slightly so the fleet won’t be quite as on edge. Looking forward to the first finisher tomorrow. Posted on July 5, 2018 Author pueoCategories Crazy Rhythm, Crinan II, Dark Horse, Dolfin, Double Espresso, Fugu, Iris, Jacqueline, Joujou, Kynntana, Morning Star, Nightmare, Owl, Passages, Racer News, Rainbow, Riff Rider1 Comment on Day 11 Summary – Remember that carnage? Well, today saw the end of the fleet reach halfway, and it appears they are getting blasted, with reports of winds at 20 kts and building to 27 kts. Just the kind of conditions the back of the fleet thrives in. The weather is warming up and some boats are having fun with squalls. The comfort clump has expanded into more of expanded mesh as boats take off and sail to their ratings. One of these is Dark Horse who has surged ahead of the slower boats and has closed the gap on some of his ultra light competitors, sneaking up behind JouJou. Nightmare continues to bullet along, giving Passages a tease as he creeps nearer. Crinan II, in contention to win after time correction, has jibed south and continues to hold his stead. Double Espresso is maintaining first to finish position and is looking at landfall likely sometime on Thursday, July 5th, if all continues to go well. Dolfin has broken away from his nemesis Jacqueline and it appears Iris and Owl may dance together next. Our eastern protector Morning Star has now under 1000 miles left to go. The wind should hold for most of the fleet, but we are hoping the tail end doesn’t get waylaid by the coming tropical disturbance upsetting the tradewind flow. Let’s all blow in the direction of Kauai, perhaps our collective hot air can help to keep the windspeed up enough. Well, no, but it would be pretty cool to watch if the whole Bay Area stood along the coastline blowing in the direction of the fleet. Digression, but it is exciting to begin preparing for finishes as the first of RC has arrived in Hanalei and is prepping everything to be ready to greet the first finisher. Mai Tais are pending! speeds in the high 6’s. They are moving right along. Sounds like folks are reefing down. Hanalei. The response was we want to get there, too. Day 9 Summary – Nearly all are halfway and puff on! Day 9 finds all but two racers ticking off the halfway point and everyone is reporting the wind building. Double Espresso is maintaining his lead in distance to finish, if he hangs on and doesn’t break anything major, we can expect that he’ll be the first to say Aloha. As the wind fills in on the whole course, there is not likely to be a whole lot of change in position among the first few boats, though those in the clump could see some movement as conditions better for heavier boats. The racers will move from “doing everything to keep the boat moving” mode, to “doing everything to keep the boat from breaking” mode. Always a fun transition. We saw Kyntanna stabilize her track a bit with the stronger winds, and Owl became our new northwest flyer, heading off even further relative to the past northerners. Nightmare also tracked more northerly today, as did Fugu. Dark Horse advanced a little further away from the comfort clump. We heard Dolfin and Jacqueline are in active avoidance mode of each other. Morning Star is still holding off to the east and Riff Rider is our southern most track. Wind should hold for most for the remainder of the race, and least for the front half of racers. Tropical weather may disrupt the tradewind flow for the slowest boats, it all depends how well they advance in the current wind. It is amazing how northerly overall this fleet has been able to sail, almost straight rhumb-lining it. And though slow, they really did not have to experience days of jelly fish passing them by. I wonder if they know how lucky they are! Posted on July 2, 2018 Author pueoCategories Crazy Rhythm, Crinan II, Dark Horse, Dolfin, Double Espresso, Fugu, Iris, Jacqueline, Joujou, Kynntana, Morning Star, Nightmare, Owl, Passages, Racer News, Rainbow, Riff RiderLeave a comment on Day 9 Summary – Nearly all are halfway and puff on! Dolfin’s whisker pole is now 12ft rather than the 20ft it was before the line just parted. Not good for downwind wing on wing sailing. I could drop the pole and try to fix it but that would take time (and a little luck) so I furled up the genoa to where it matched the new shorter pole and now it’s more like a storm jib. The reduced sail area was painful on speed so there was nothing for it but to shake out the reef in the main. Of course we then went from just wild rolling to truly bizarre rolling which the autopilot doesn’t seem to like much. Tonight the wind should pick up above 20kts and the reef will go back in. Guess it’s my turn for some bad luck too.